Heat the oven to 350°F and grease a baking sheet with vegetable oil. Then in a small bowl, mix the ketchup with the mustard to make the sauce. First season the tilapia filets with salt and pepper on both sides. Afterwards, coat each side with the prepared sauce using a cooking brush or just your hands. Place the filets on the baking sheet and then layer the slices of zucchini, onion, and bell pepper over the tilapia. Lightly season the vegetables with salt and pepper. Cover the top with aluminum foil to help keep the juices in while cooking. Bake for 15 minutes, and then remove the foil covering. Let cook for an additional 10 minutes before serving. Enjoy! 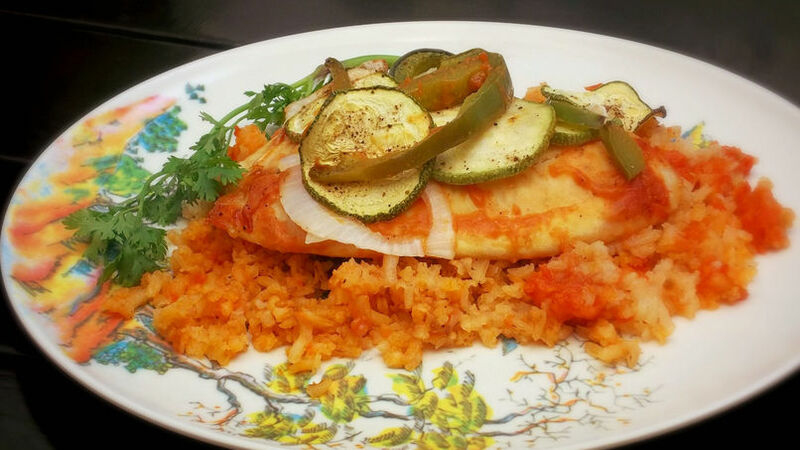 If you don’t like fish, this recipe will still turn out deliciosa using chicken breasts in place of tilapia. To reduce clean-up time, line the baking sheet with aluminum foil. Ever since I can remember, fish have fascinated me. When I was little, I would go fishing with my mother and I even had my own fishing pole. Unfortunately, my sons aren’t so fond of fish, and my husband prefers shrimp and octopus. There is only one type of fish I can get them to eat: tilapia. They like it because its flavor is not as strong as other types of fish. And I love it because it’s so versatile! My kids’ favorite recipe is baked tilapia with a sauce made from ingredients that are always present in most kitchens: ketchup and mustard. The combination of these condiments gives a sweet ‘n’ sour taste to the dish that kids love. Try it and you’ll see!